Members of this family are chiefly known for their characteristic behaviour; they mostly forage for insect prey on the trunks and branches of trees, and often communicate by drumming with their beak, producing a reverberatory sound that can be heard at some distance. Some species vary their diet with fruits, birds' eggs and small animals, and tree sap. They mostly nest and roost in holes that they excavate in tree trunks, and their abandoned holes are of importance to other cavity-nesting birds. They sometimes come into conflict with humans when they make holes in buildings or feed on fruit crops, but perform a useful service by their removal of insect pests on trees. The Picidae are one of nine living families in the order Piciformes, the others being barbets (comprising three families), toucans, toucan-barbets, and honeyguides in the clade Pici, and the jacamars and puffbirds in the clade Galbuli. DNA sequencing has confirmed the sister relationships of these two groups. The family Picidae includes about 240 species arranged in 35 genera. Almost 20 species are threatened with extinction due to loss of habitat or habitat fragmentation, with one, the Bermuda flicker, being extinct and a further two probably being so. 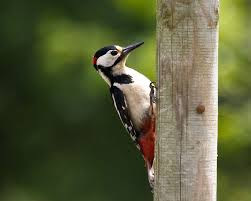 Woodpeckers range from tiny piculets measuring no more than 7 cm (2.8 in) in length and weighing 7 g (0.25 oz) to large woodpeckers which can be more than 50 cm (20 in) in length. The largest surviving species is the great slaty woodpecker, which weighs 360–563 g (12.7–19.9 oz), but the probably extinct imperial woodpecker and ivory-billed woodpecker were both larger. Woodpeckers, piculets and wrynecks all possess characteristic zygodactyl feet, consisting of four toes, the first (hallux) and the fourth facing backward and the second and third facing forward. This foot arrangement is good for grasping the limbs and trunks of trees. Members of this family can walk vertically up a tree trunk, which is beneficial for activities such as foraging for food or nest excavation. In addition to their strong claws and feet, woodpeckers have short, strong legs. This is typical of birds that regularly forage on trunks. Exceptions are the black-backed woodpecker and the American and Eurasian three-toed woodpeckers, which have only three toes on each foot. The tails of all woodpeckers, except the piculets and wrynecks, are stiffened, and when the bird perches on a vertical surface, the tail and feet work together to support it. Woodpeckers have strong bills for drilling and drumming on trees, and long sticky tongues for extracting food. Woodpecker bills are typically longer, sharper and stronger than the bills of piculets and wrynecks; however, their morphology is very similar. The bill's chisel-like tip is kept sharp by the pecking action in birds that regularly use it on wood. The beak consists of three layers; an outer sheath called rhamphotheca, made of scales formed from keratin proteins, an inner layer of bone which has a large cavity and mineralised collagen fibers, and a middle layer made of porous bone which connects the two other layers. Combined, this anatomy helps the beak absorb mechanical stress. Species of woodpecker and flicker that use their bills in soil or for probing as opposed to regular hammering tend to have longer and more decurved bills. Due to their smaller bill size, many piculets and wrynecks will forage in decaying wood more often than woodpeckers. The long sticky tongues, which possess bristles, aid these birds in grabbing and extracting insects from deep within a hole in a tree. It has been reported that the tongue was used to spear grubs, but more detailed studies published in 2004 have shown that the tongue instead wraps around the prey before being pulled out. Many of the foraging, breeding and signaling behaviors of woodpeckers involve drumming and hammering using the bill. To prevent brain damage from the rapid and repeated impacts, woodpeckers have a number of physical features evolved to protect the brain. These include a relatively small and smooth brain, narrow subdural space, little cerebrospinal fluid (CSF) surrounding it to prevent it from moving back and forth inside the skull during pecking, the orientation of the brain within the skull (which maximises the contact area between the brain and the skull) and the short duration of contact. The skull consists of strong but compressible sponge-like bone which is most concentrated in the forehead and the back of the skull. Computer simulations have shown that 99.7 percent of the energy generated in pecking was stored in the form of strain energy, which was distributed throughout the bird's body, with only a small remaining fraction of the energy going into the brain. The pecking also heats up the woodpecker's skull, which is part of the reason why they often peck in short bursts with brief breaks in between, giving the head some time to cool. During the millisecond before contact with wood, a thickened nictitating membrane closes, protecting the eye from flying debris. These membranes also prevent the retina from tearing. The nostrils are also protected; they are often slit-like and have special feathers to cover them. Woodpeckers are capable of repeated pecking on a tree at high decelerations on the order of 10,000 m/s2 (33,000 ft/s2) (1000 g). Some large woodpeckers such as Dryocopus have a fast, direct form of flight, but the majority of species have a typical undulating flight pattern consisting of a series of rapid flaps followed by a swooping glide. Many birds in the Melanerpes genus have distinctive, rowing wing-strokes while the piculets engage in short bursts of rapid direct flight.